Home » General News » The Blue Sulky. Harness racing, or “trotting”, has long been associated with the Melton-Toolern Vale – Bacchus Marsh area. So close has this association been that when the major harness racing venue was moved from Moonee Valley, the chosen location was Melton. Tabcorp Park is now a well-known landmark on the Western Highway. Trotting tracks can still be seen in the Coimadai district. One of the well-known owner/trainer/drivers of the district is Greg Carr. Greg had major successes with his horse ‘Super Mover’ in the 1970s, winning races at Geelong, Boort and Maryborough. Greg and his wife, Tineke, donated Greg’s blue winning sulky to the cottage and forge. As they are made of wood, these sulkies are a safety hazard in races, being likely to splinter if a crash occurred. 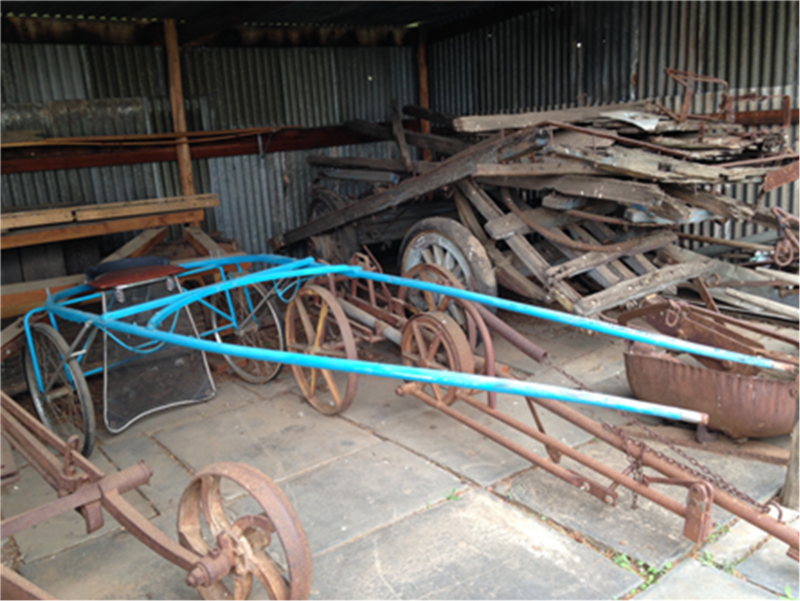 This blue sulky was restored by members of the Bacchus Marsh Men’s Shed and is housed under shelter on our site. We are very pleased to be the custodians of this reminder of the history of harness racing and the role played in the sport by the men, women and horses of the district.